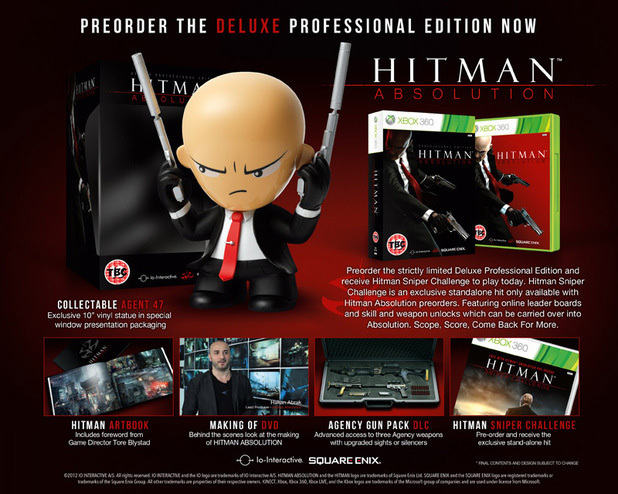 A 10″ vinyl statue of Agent 47. Everything in the previously announced Professional Edition (a hardcover art book, a making-of DVD and an unlock code for the game’s Agency Gun Pack DLC). Access to the Agency Jagd P22G pistol, the Agency HX UMP SMG and the Agency SPS 12 semi-automatic shotgun. The Hitman Sniper Challenge mini-game. There is no official word on the price yet or if this package will be available in both the US and Europe. Hitman Absolution will launch worldwide for the Xbox 360, Playstation 3, and PC on November 20th, 2012.